By Jonathan Amos BBC Science Correspondent, 26 Nov 2018. The InSight lander is being targeted at a flat plain just north of the planet's equator called Elysium Planitia. It carries a suite of instruments - many of them from Europe - to try to determine the rocky world's internal structure. As with previous surface missions, InSight must survive the "seven minutes of terror" - the time it takes for a probe entering Mars' thin atmosphere at hypersonic speed to slow to walking pace and gently put itself on the ground. Many have tried; most have failed. "As humanity, as explorers - we're batting at less than 50%," said Nasa's science chief, Thomas Zurbuchen. "Going to Mars is really, really hard." InSight has some heritage on its side. 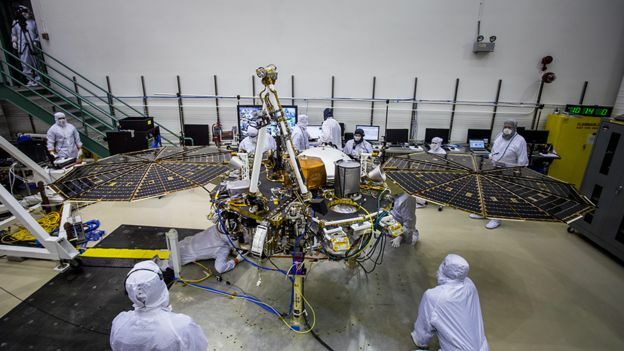 It will be using the exact same combination of heatshield, parachute and retro-rockets that proved so successful in positioning Nasa's Phoenix probe in Mars "Arctic" in 2007. "We've done all the preparations that we can possibly think of to make sure that our entry, descent and landing (EDL) goes as smoothly as we can imagine," explained project manager Tom Hoffman. "But Mars as a planet does not always behave. I think our team is ready; I think the spacecraft is ready. 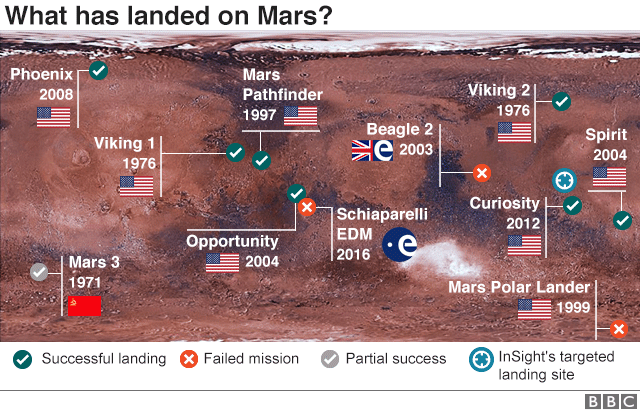 We just don't know if Mars is ready," he told BBC News. The EDL engineers have been closely watching the weather on the Red Planet, looking especially for any dust storms and evidence of high winds that could complicate InSight's passage through the atmosphere. The probe's trajectory was altered ever so slightly on Sunday, to ensure it is lined up perfectly with the targeted landing zone on Elysium Planitia. InSight will transmit messages as it heads down to the surface. These will be relayed back to Earth via two small satellites flying overhead. Radio telescopes at Earth will also be tracking the probe's progress just in case the primary communications link falls over. 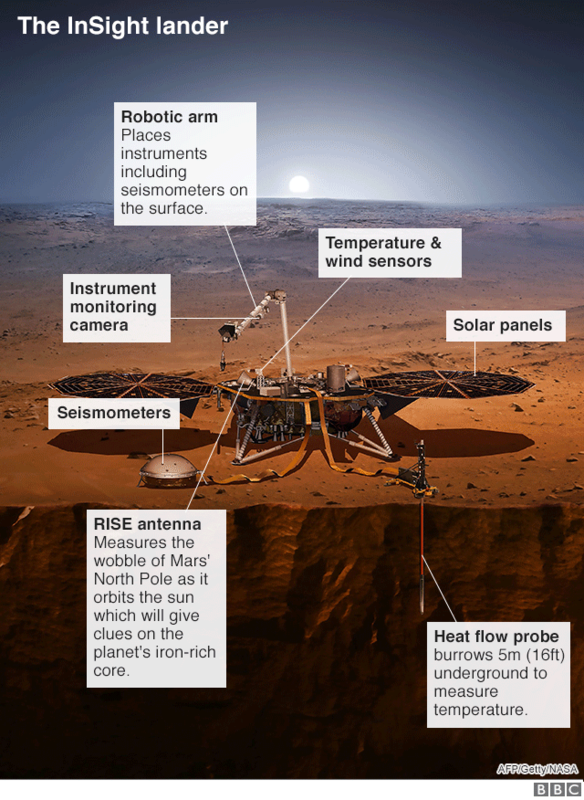 This will be the first probe to dedicate its investigations to understanding Mars' interior. Scientists want to know how the world is constructed - from its core to its crust. InSight has three principal experiments to achieve this goal. The first is a package of Franco-British seismometers that will be lifted on to the surface to listen for "Marsquakes". These vibrations will reveal where the rock layers are and what they are made of. A German "mole" will burrow up to 5m into the ground to take the planet's temperature. This will give a sense of how active Mars still is. And the third experiment will use radio transmissions to very precisely determine how the planet is wobbling on its axis. Deputy project scientist Suzanne Smrekar uses this analogy: "If you take a raw egg and a cooked egg and you spin them, they wobble differently because of the distribution of liquid in the interior. And today we really don't know if the core of Mars is liquid or solid, and how big that core is. InSight will give us this information." Scientists understand very well how Earth's interior is structured, and they have some good models to describe the initiation of this architecture at the Solar System's birth more than 4.5 billion years ago. But Earth is one data point and Mars will give researchers a different perspective on how a rocky planet can be assembled and evolve through time.